From halcyon days spent in the London Science Museum’s maths gallery, to under the hood of his first Leyland Sherpa van, we’re about to journey deep into the mind of Conrad Shawcross. The London-based artist is the subject of Pyschogeometries, a new book published by his gallery, Victoria Miro, and arts magazine Elephant, that investigates his practice photographically, illustratively, and through a series of writings. It’s the first book of its kind that goes into such edifying detail about the artist’s work to date. What strikes you immediately when reading it: Shawcross’ practice is remarkably complex. Hang from every word as he jumps from reference to reference, from the philosophy of science, to childrens’ toys, Greek mythology, Renaissance architecture and Buckminster Fuller. Keep up if you can. His sculptures may appear, on one level, like ‘childlike stacks of blocks’ (his words), but there’s incredible allusion, architecture and abstraction here – and that’s what this book focuses on. ‘This is conceptual art that somehow also hits us in the preconscious, connects us with our most elemental wirings,’ Wallpaper* senior editor Nick Compton writes in the introductory essay, capturing the essence of the book’s title. ‘Pyschogeometries’, a theory coined by Italian physician Maria Montessori (1870-1952), suggests that being introduced to geometries at the earliest stages of development can fire up crucial neural connections and aid learning and insight – in all areas – throughout our lives. Geometry is, she suggests, ‘a gymnasium for the mind’, a way to stretch our intelligence abstractly, before we have the life materials to do it for real. Shawcross stretches his psychogeoemtrical instincts across tetrahedral systems – a motif that recurs throughout his work, in Formation (2015), Paradigm (2016), in the Optic Cloak tower in Greenwich (2016), and in the recent Fractures sculptures (2018). In the book, Shawcross explains how he is interested in the tetrahedron mathematically, but also because of what it represents. The tetrahedron lies at the basis of nature, most obviously in H2O at molecular level, and in DNA, which comprises molecular variants of what Buckminster Fuller called the ‘tetrahelix’. 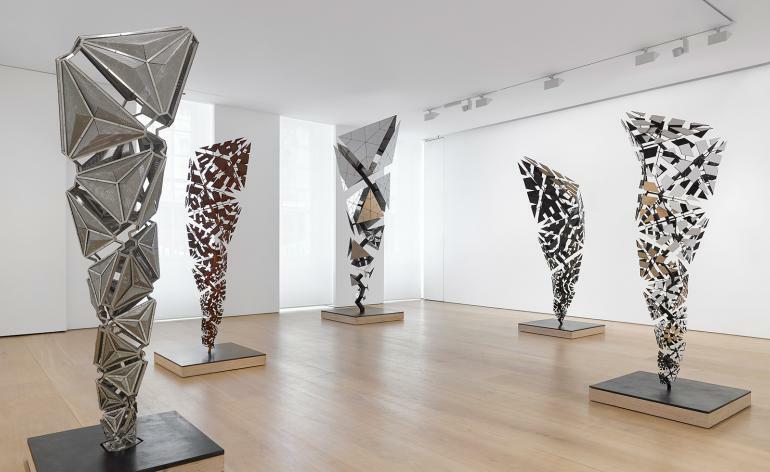 These towering, brink-of-collapse, ‘whisp of smoke’ sculptures represent nature, and humanity, at its most elemental. Frankenstein, maybe. Roboticist, for sure. With AI on the rise in the 2010s, Shawcross’ interest in mechanics moved into robotics. ‘I came across a five-axis robot in an art fabrication studio and it kind of stopped me in my tracks,’ he explains of his first interaction with artificial intelligence, linking it to artistic progression. For Shawcross, coding is a kind of choreography – quite literally in the case of his 2012 collaboration with Wayne McGregor and Kim Brandstrup at the Royal Opera House, where he hard-coded a relentless robotic arm (‘Diana’) to dance alongside Royal Ballet’s best – Carlos Acosta, Leanne Benjamin, Tamara Rojo and Ed Watson, in swinging, pulsating time to the score. Through all this talk of geometries, mechanics, robotics, and what the artist calls ‘audacious structural forms’, it might be all too easy to assume that Shawcross’ work lacks sensitivity, or emotion. But this is to miss his musicality, flowing contours, rhythms, references, histories. The poetics of his work is heard most clearly in the chapter called ‘Harmonics’, which focuses on Shawcross’ attempts to transmogrify sensory experiences of music into a visual medium. The pages are lined with intricate drawings, made by pendulum driven pencils; works in lighting design that dance across the page; looping sculptures that make cast iron appear weightless.